I love the idea of retelling Jane Austen stories in more modern time periods, and I recently reread Persuasion itself and remembered how much I loved it, so I was really excited to read this. I think the fact I had read Persuasion so recently was both a good thing and a bad thing. Part of me enjoyed having the story so fresh in my mind, but the other part of me really wished the retelling had been less straightforward and a little more creative. Because it is an exact retelling, with exactly parallel characters and every exact plot point pulled into the 1930s setting. I was expecting or would have preferred to have an inspired, but not so exactly retold, story, because in this case I always knew what was going to happen next and so throughout the middle I got a little bit bored. Plus, I do think that Jane Austen’s very episodic structure (a lot of barely connected incidents happening throughout the middle of the story and eventually building to a conclusion) doesn’t work quite as well for a modern novel. But that’s just a personal preference. And it was probably my fault for having read the original novel so recently. 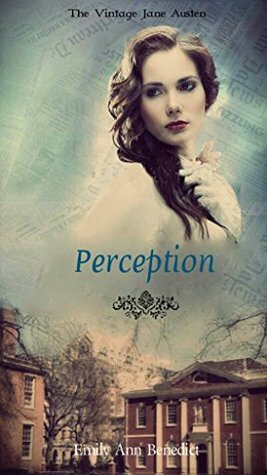 The characters were interpreted quite well, and the author didn’t use the direct retelling as an excuse to get lazy (for the most part – Veronica’s place in the story felt a little underdeveloped). I loved Sam’s added significance – she seemed like a much stronger character in this retelling than in the original novel, from what I remember, although I’ve always liked her. I’ve always liked Charlie’s counterpart in the original book, too, for some reason, and Perception highlighted those likeable characteristics. I also especially thought Robert and Bonnie were translated into the 1930s setting very well and liked reading about them. I would have liked to see more exploration of some of the themes Austen hints at in the original story. But not all books have to be deep, and this one succeeded at being a light, comfortable story that brought me stress relief and a little bit of joy. Even if it’s not the deepest book in the world, the writing is good (unlike so many “light” novels) and I was able to finish it in a few days. Overall, while it wasn’t quite the creative retelling I was hoping for, I enjoyed this book a lot. If you’ve read Persuasion, but not too recently (wait a few years and forget some of the plot points), and are looking for something light and quick and clean, then pick this up! What do you think? Have you read this? If so, did you like it? Share in the comments below!